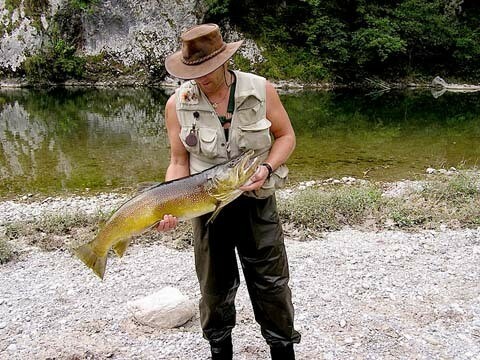 Slovenia – trout and grayling fishing on the beautiful rivers of Slovenia such as the mighty Soca. Trip led by the esteemed fly fisher and writer Paul Procter and chalkstream guide Howard Taylor, in conjunction with Slovenia Fly Fishing. Slovenia is quite a small country that lies at the foot of the Julian Alps, from which most of the rivers run through lush green valleys surrounded by heavily tree lined hills. All of the rivers are spectacular in both vista and fishing. They are calcium rich, similar to our chalkstreams and capable of producing very big fish. Nearly all run over golden pebbles or gravel, making for fairly easy wading. Most of these rivers are home to a species unique to Slovenia called the marble trout, which grows to a large size often in excess of 20lbs! while double figure wild rainbows are also not uncommon! They also hold brown and hybrid brown trout which again grow big. Whopper grayling and large brook trout can be found as well. The fishing on offer is truly world class. Paul Procter has been fishing these Slovenian rivers for many years, and whilst a guide is not essential, Paul’s knowledge will be invaluable in putting us onto the best stretches. He is actually on his second visit there this season as we speak.